RAIN, hail, shine or strong winds for Ardene's fourth on-property spring stud and flock sale on Friday 20 October, would not have worried anyone this year, with the great addition of a new sale and breeding shed. However, the sun was shining and buyers were in the mood for spending some well earned money. It was another successful sale for Ardene, with all 10 stud rams selling to a top of $7500 to average $4195 - this average is up close to $900 on last year with the top being up $2250. 16 of the 20 stud ewes sold to $2500 for an average of $1900 while 49 of the 60 flock rams sold to $3700 to average $1455. The 20 stud ewes kicked off the sale with a bang with Lot 1 starting the run at a price of $2000. However the top price was found in Lot 9 selling for the top price of $2500. Repeat buyers, Tintern Pastoral, Euroa, purchased this July drop ewe who is sired by Tattykeel 140486 and out of Ardene 140191. While lots 8 and 10 were sold for the equal second top price of $2200, both being purchased by Rob, Suzie and Allistair Coulson, The Point Pastoral, Birregurra. They went on to buy a total of six stud ewes to average $1816 while also purchasing the first stud ram offered, lot 21 for $3000. The Point Pastoral were one of the volume buyers on the day, purchasing this number of ewes to help build up their stud numbers for their stud. We find these sheep to be good shedders with great shape. Mr Coulson said. The stud rams sold to equally strong demand, with all 10 rams selling to a top of $7500 to average $4195. Lot 23, Ardene 160463, a twin ram sired by Ardene 150108. He sold for the sales top price of $7500 to Danny Teskera, Roslynmead West Sheep Studs, Echuca. This ram has been affectionately named Dermie, as Mr Teskera is a keen Hawthorn supporter. Dermie has been successfully shown, winning Reserve Champion Australian White Ram at the Bendigo Sheep & Wool show in July, while backing this up and bringing home Grand Champion Ram at Adelaide Royal Show in early September. I liked this ram for his head quality as he has well hooded eyes with good black pigment of nose and feet. I am really chasing a ram with good growth, loin and bone in a well balanced sheep and this ram fitted all that. This ram is the youngest in the sale draft at only 11 months, I think he will produce me even lines of flock rams with real meat, power and body length. Mr Teskera said. In the Flock ram draft, Lot 31 was the category topper, purchased by JD Farm Trust, Geelong for $3700. There was once again, great volume buying on the day, with many people snapping up the Ardene genetics. Michael and Tracy Mills of Mills Farming, Kangaroo Island, purchased seven rams on the day to an average of $1757. We have been following the Ardene program; they run a tight operation in regards to their breeding. So when we moved over from crossbreeds 18 months ago, we knew we would come to Ardene to get our first rams. We have similar rainfalls as Ardene, so we find their rams really hold up to our conditions with better feet, they are good shedders and a great temperament. Mr Mills said. Cooper Lamprey, Moriarty, Tasmania was back again to purchase more ewes for his growing stud, Wallaby Creek. Mr Lamprey purchased five stud ewes for an average of $1680, one stud ram for $3000 and two flock rams to an average of $1450 to take back to Tasmania to an overall average of $1787. I am very happy with the three ewes I purchased last year hence why I returned this year. I am finding they are performing very well in the Tasmanian conditions. I look for the sheep with the black features, so nose and feet and also a good hair pattern, the clean shedders. Mr Lamprey said. Jannie Hodgson, Ardene saidWe are very pleased with the outcome of the sale, as the sheep all presented very well. With plenty of spirited bidding from a wide spread of buyers from WA, NSW, SA, Vic and Tasmania which were all well represented. 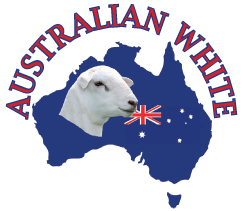 Landmark Auctioneer, Andrew Sloane said This is my first Australian White sale, I saw a great market for Australian White sheep, as the sale was very impressive. Top priced ram, Ardene 160463, purchased by Roslynmead West Stud, Echuca, Vic.